Every football fan knows how the 2015-16 Premier League season ended. With 5000/1 odds in August to be champions, Leicester City shocked the football world when they clinched the Premier League title. Based on their 2014-15 showing, relegation from the top flight following the 2015-16 season looked more likely than winning it. Nigel Pearson’s men ended that season with 11 wins, eight draws, and 19 losses, finishing in 14th with 41 points. Not even the most optimistic of Foxes supporters would have envisioned their club winning the League the next season. Claudio Ranieri’s first five games in charge of the Foxes yielded 11 points. What does this have to do with Watford? Let’s find out. At the end of the 2017-18 season, Javi Gracia’s Watford finished in 14th place and 41 points. The Hornets managed 11 wins, eight draws, and 19 losses. Sound familiar? They’ve started the 2018-19 season in fine form, earning 12 points from their first five games. Will they emulate the Foxes? Can they push for the Premier League title? Will they fall away? Whatever the outcome may be, Javi Gracia has laid a solid foundation. With his variation of the 4-4-2 and a core group of players that fit his philosophy, Gracia has all the ingredients for success. Though wingers are a rare commodity for the Hertfordshire club, what they do have in abundance are technical midfielders. Gracia’s men start in a 4-4-2, which ends up being a 4-2-2-2 on the ball. 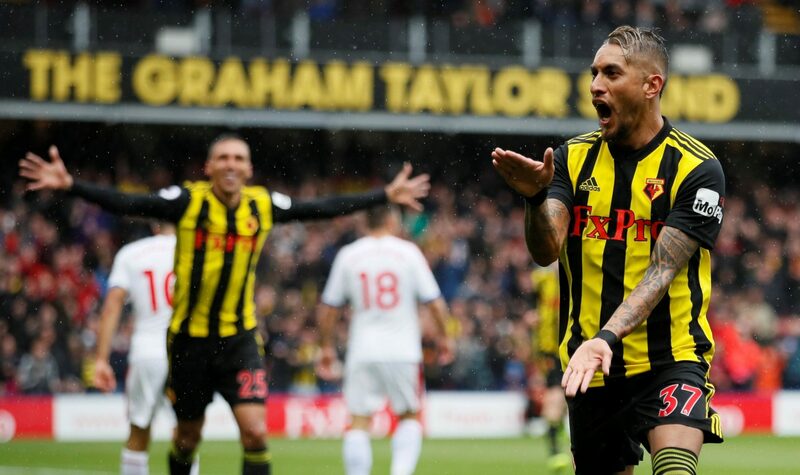 Roberto Pereyra and Will Hughes play in close to the touchline, with Abdoulaye Doucouré and Etienne Capoue taking up the central defensive positions. Not too dissimilar to Unai Emery, Gracia wants his wide players to tuck in and have freedom on the ball. With the wide midfielders taking up the half-spaces, the fullbacks are allowed to bomb on. Daryl Janmaat and Jose Holebas don’t need to be told twice to overlap. Doucouré and Etienne stay back to help clean up and provide cover. By creating attacking overloads and with the wide midfielders tucking in, there is more than enough of a goal threat. What’s interesting about Gracia’s 4-4-2 is that, as an in-game match management technique, he urges the centre backs to play a direct ball up to either Troy Deeney or Andre Gray, bypassing the midfield altogether. With both forwards comfortable with challenging in aerial duels, opposing centre backs will not be able to mark either entirely out of the game. Due to the limited midfield involvement in the build-up, it allows Pereyra and Hughes to take up central positions, waiting for knock-downs and latching onto stray balls. Off the ball, Gracia has tweaked the classic pressing system. Watford won’t go flying in, but instead, they force the opposition into certain positions which either: 1) Make playing out the back risky and 2) Makes them play long balls out. Gracia puts a great deal of trust in his centrebacks, usually Craig Cathcart and Christian Kabesele, to win balls in the air. There are shades of José Mourinho in Gracia’s pressing too, with the Portuguese preferring to use the sidelines as a “third man” to press. Don’t be fooled, if there’s a chance to win the ball from a loose touch or a bad pass, Watford will press and win the ball back. If that doesn’t happen, they retain their shape. Although each member has played a vital role in the Hornets’ early-season success, one player, in particular, has been in scintillating form. That man is Roberto Pereyra. While the Argentinian was in Italy with Juventus, he was given freedom to roam and carry the ball from deep positions. This allowed him to connect well with Álvaro Morata, Fernando Llorente, and Carlos Tévez. When he left Juventus for Watford, the Vicarage Road faithful were excited, and rightly so. Pereyra brought something different to the club. The midfielders used in the #6 and the #8 role included: Ben Watson, Mario Suárez, Valon Behrami, and Almen Abdi; none of whom excelled at receiving the ball from the centrebacks and driving into the attacking third. In his first season in the Premier League, Pereyra only managed to make 13 appearances. In 2017/18, however, he was involved in 31 league games, and created 23 chances and made 21 key passes. In just five games of the 2018-19 season, he already has eight key passes. Given that Gracia has granted Pereyra and Hughes the freedom to roam, expect the two to be involved in more goals. The wide players must also play a role in connecting the midfield to the front two, resulting in increased touches and time on the ball. This isn’t the first time that Watford has started quickly. In 2015-16, they flew out the blocks in the first half of the season. At the end of December and early January, Watford was sitting pretty in 7th place, above Liverpool and Chelsea. They had only lost five games. However, the second half of their season was as disastrous as their first half was excellent. Come Week 38, Watford finished in 13th place, losing a total of 17 games. Javi Gracia will not want to emulate former Watford boss and fellow Spaniard Quique Sánchez Flores’ timid spring term. Consistency at the highest level is an arduous task, but not unobtainable. Time will tell whether or not Gracia can keep the Hornets buzzing.